Super Typhoon Vongfong, Japan: The strongest storm for 2014 so far. Yikes. Here’s one of the strongest storms ever, illuminated only by moonlight. 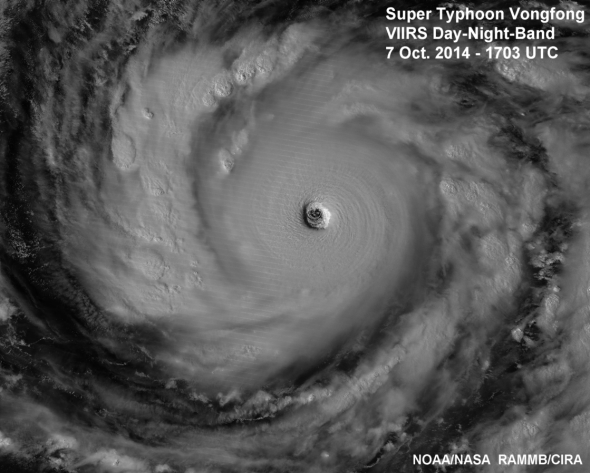 Super Typhoon Vongfong is a sheer beast of nature. On Tuesday afternoon, the storm strengthened into the most powerful tropical cyclone on Earth so far in 2014 and now packs estimated sustained winds of 180 mph and momentary gusts faster than a Formula 1 racecar (220 mph), according to the Joint Typhoon Warning Center in Pearl Harbor, Hawaii. This is the type of storm meteorologists dream of. Far from land, Vongfong is putting on a show rarely equaled since humans have been able to watch from space. As a result of its growth spurt, Vongfong’s spiral bands are now drawing moisture from Indonesia and the Indian Ocean, thousands of miles away. Unbelievably, the storm could grow even stronger. Over the next 24 hours, JTWC expects Vongfong to strengthen to within a few miles per hour of last year’s Typhoon Haiyan, which is widely considered to be the strongest storm to ever make landfall, anywhere in the world. By Wednesday, Vongfong could pack wind speeds of up to 230 mph for a few seconds at a time. But this is no Haiyan. In sharp contrast to that disaster, Vongfong should remain at sea for at least the next two days before approaching Japan this weekend as a much weaker version of itself. Still, the effects on the disaster-weary archipelagic nation could be profound, with the Tokyo region still recovering from nearly two months’ worth of rainfall in little more than a day thanks to another typhoon, Phanfone, less than a week ago. Mudslides and additional flooding are likely across nearly the entire southern half of the country as Vongfong approaches. In the meantime, meteorologists around the world can relax and behold a rare feat: a nearly perfect expression of nature’s fury. Vongfong is bound for Japan this weekend.